Is Bitcoin Too Wild To Trade? We hold a position consisting of two round lots with a cost basis that has been reduced by profit-taking to 14022. Entry came on December 8 via an explicit recommendation to get long at 16042. 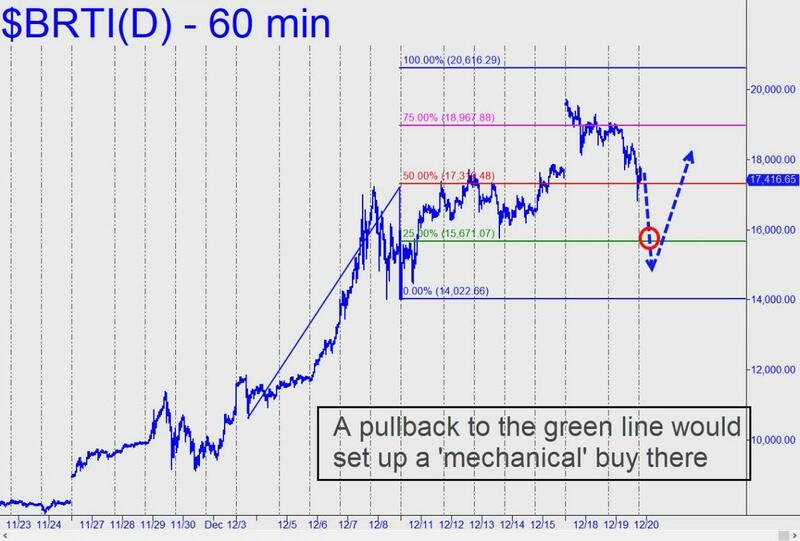 The paper-trade was offered mainly to demonstrate the ease and effectiveness of a tactic known by Rick’s Picks subscribers as a ‘mechanical’ entry. This set-up is designed to hold risk and reward constant at 1:3 from entry to exit. My current price target is 22,101, a ‘Hidden Pivot’ resistance that is also my minimum upside projection for $BRTI, a non-trading CME symbol that aggregates the order books of some the most popular bitcoin exchanges. I am now recommending that traders exit a third round lot (from an original four) at 20616. I will also recommend bidding 15671 for two round lots, stop 14021, good through Friday. This would double the size of our position. An attempt to do so on Tuesday morning at 17319 got timed out with a noon expiration. Please note that these trades are being offered on this site and at FXStreet.com as paper trades to help allay skepticism that bitcoin can be tamed for trading purposes. As more such trades are offered in the future, I would suggest that you keep score of profits and losses based on whether my recommendations would have worked for you personally. In general, my instructions will be detailed, explicit and timely, and entry will almost invariably be by way of a limit bid.